The Greene Manor is a wonderful gathering place for family reunions, business retreats and friend getaways. It is a great place for a small gathering or a small Family Reunion! It sleeps up to 10 adults and 10 children. This beautiful historic home is centrally located in St. George and has a PRIVATE ON SITE TENNIS COURT, Bullfrog HOT TUB and a fabulous PRIVATE SWIMMING POOL (April-October). The main home has character, space, and beautiful bedrooms. The kitchen has been updated beautifully and is attached to a family room that is perfect for large groups to gather and play games or watch a movie on the flat screen TV. This home also has a large well kept yard perfect for games and lots of space for children to play. In the pool area there is a beautiful BBQ and serving area. A beautiful veranda is located in the pool area. Included in the rental is a small second home, the 'Carriage House.' This home was originally built as a carriage home, and has been renovated with a loft area and bedroom. This is a fun place to stay in addition to the beautiful main home. This is a beautiful and well-kept home that has been renovated with the finest of amenities and decor. The Greene Manor is an exquisite home that will be perfect for your gathering, small or large- the Greene Manor is perfect! We do not allow wedding receptions or parties. Family reunions may have 20 people max. It is a beautiful, well-kept home, we want to keep it in pristine condition. New Bullfrog hot tub, in private pool area. Private on site Tennis Court! We loved our stay at the Greenemanor. Very big home with big bedrooms and comfy beds. The property is well-kept, everything was clean and the landscaping is lovely. The kids had a blast playing on the huge property. 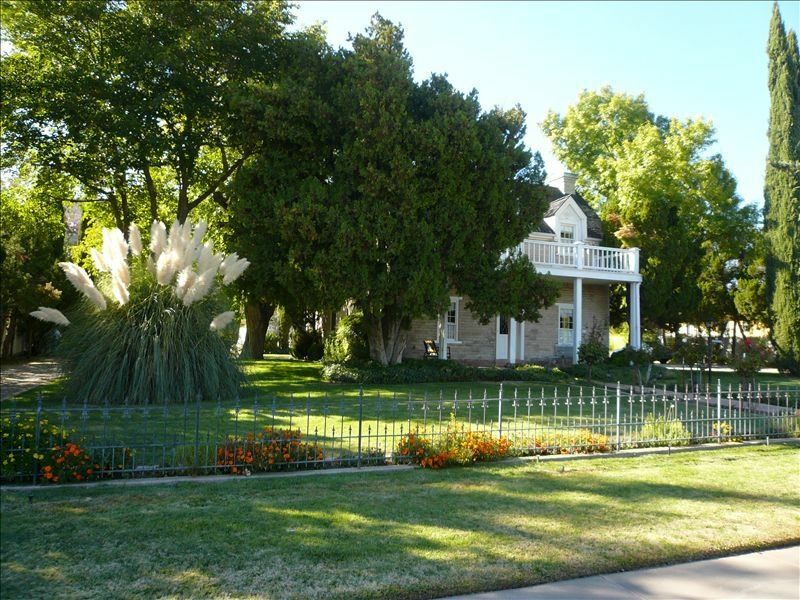 It’s one of the few rental properties that a located in the center of St. George. You don’t even need a car to get to Bars, Restaurants etc. Pool, Hot Tub and Tennis’s Court on side. What else do I need to say?! This is an absolutely amazing property. It is the perfect setup for a multi family stay. The house is huge and has huge bedrooms. The outdoor cottage is fantastic for families to sleep in. The location was close to parks and main roads. We had a blast swimming in the pool and playing tennis. We loved the big kitchen and dining room. We can’t wait to come back again!!!!!!!! It's a beautiful, quaint home. Our Women's soccer team stayed in this home. They complimented the home. We had a great time. There were a few issues that I will bring to the attention of the website. The refrigerator door doesn't have guard rails and this diminished the capacity to hold more items. We couldn't turn on the Hot Tub, (no directions that we could find). Swimming pool is NOT heated. We did appreciate that the bathrooms were stocked with shampoo, conditioner and body wash. When we stayed here it was dirty, not vacuumed, mold in the coffee maker, cob webs, mold in the showers, broken tiles and dead bugs all over. The first night we found 2 brown recluses. The next morning we found another brown recluse and a black widow. We checked out after staying there only one night. After many emails to Sarah we were assured some thing would be done once she talked to the owner. We were also informed that they changed property managers and they received other complaints. I was told we would receive at least a partial refund since we only stayed one night. We have yet to hear back or receive anything. It’s been almost 2 months. We have been renting this home for over 20 years and have not received any complaints like this. When I read this review I reached out to our local house manager and our professional cleaners to see what transpired. They did not know that our guests had left until after they were gone. The local house manager was not contacted and the professional cleaners had not heard of anything either. Their names and numbers are clearly visible to all quests. We are very appreciative of the numerous times that this family has stayed at our home. Our cancellation policy of 50% refund if notified within 15 days 100% refund if notified within 30 days has been in effect for 20 years. Our guests chose to move out the next day and did not give us any notice or chance to rectify any issues; therefore we offered no refund. We do our very best to maintain our home. We have professional cleaners and pest control I believe that this is over our refund policy more than the cleanliness of our house. We traveled to St. George for the half IM event in May. This was our first time in St. George. Our stay could not have been more perfect as we had a beautiful home away from home at the Green Manor House. We were able to walk to the town square from the house and quickly drive to the interstate. The house has everything that you need, from lots of towels to very comfy beds and plenty of TV's. The carriage house was perfect as another sleeping option with plenty of beds. The house has a lot of charm and history. We had plenty of room and space. We will return back again and we hope to stay in the house next year! A short drive to the amazing Zions National Park! We charge $450/night as the base rate. If you have over 10 adults or over 8 adults and 4 children we charge $25/extra per night per person. We also have a LAST MINUTE RATE of $150 off per night if you book a last minute reservation. Please email or call with questions.